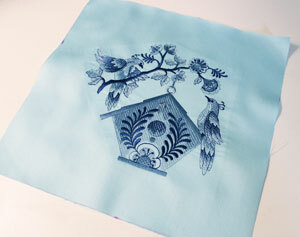 Pretty print fabrics can be a pleasing way to highlight embroidery, as this elegant table topper shows. Pair your favorite print with complementary embroidery on a solid cotton fabric, and you'll have a decor item unlike any other. 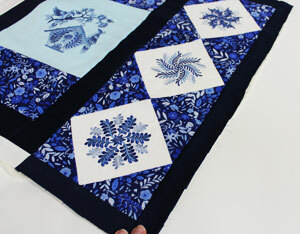 Read on for instructions to make a unique and lovely quilted table topper! 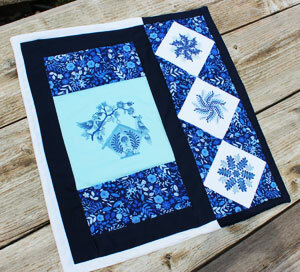 I used the 6" x 10" size of the Delft Blue Birdhouse 1 design and the 4" x 4" sizes of the Blue Fern Medallions. Designs 6" x 10" and smaller work well on the large left hand square, and designs 4" x 4" and smaller fit on the smaller diamonds down the right side. 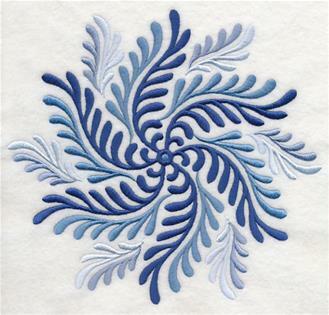 Let your imagination fly with design possibilities for this table topper! 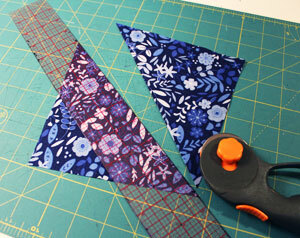 First, I prepared the diamond shaped blocks by drawing a 5 1/2" by 5 1/2" square (diamond) on the quilter's cotton. I drew lines connecting the points; where the lines meet is the center of the shape. 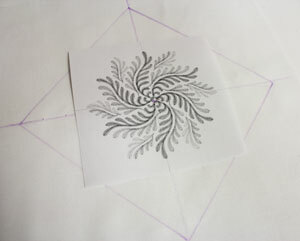 To position my embroidery design within the diamond shape, I created a paper template of the design. If you're new to using templates, click here for a quick tutorial. I poked a hole in the center of the template and lined it up with the center point on the fabric, making sure the design fit well within the shape with at least 1/2" between the outer edges of the design and the edges of the shape. Next I removed the template, sprayed a piece of medium weight stabilizer with temporary adhesive, and smoothed the fabric on top. I hooped the fabric and stabilizer together by lining up the marks on the hoop with the lines on the fabric. Attach the hoop to the machine and load the design. 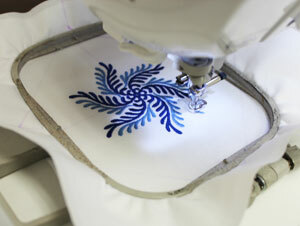 Move the hoop so the needle is directly over the center point on the fabric and embroider the design. 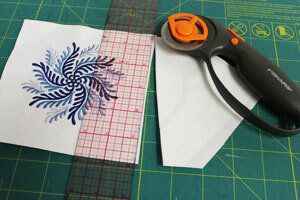 After the design is finished, cut out the shape with a rotary cutter and straight edge. I left the stabilizer on the backside of the quilter's cotton so the edges of the stabilizer will not show through the thin fabric. Next I prepared the outer pieces of the diamond blocks by cutting a 6 1/2" by 6 1/2" square from the print quilter's cotton. Then I cut the square in half diagonally. Then I cut the halved pieces in half again, for a total of four pieces. 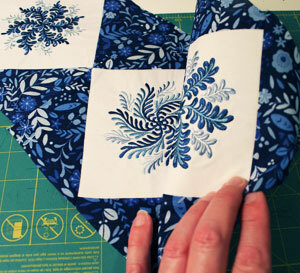 To assemble the diamond blocks, I laid one of the print fabric pieces on top of the embroidered block, right sides together, with the long edge of the print piece aligned with one of the edges of the embroidered piece. 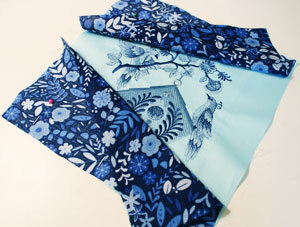 I allowed about 1/2" of each end of the print piece to extend over the edges of the embroidered piece. I pinned in place and sewed a 1/4" seam along the pinned edge only, then pressed the seam open with an iron along the backside. 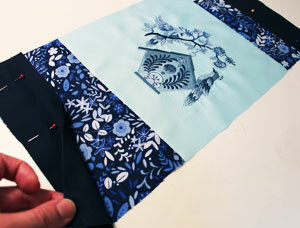 I repeated the process in the step above, adding the remaining print pieces to the embroidered block. 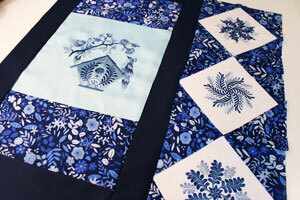 Then I repeated the entire process for each embroidered block. To put the diamond blocks together to create the right side panel of the topper, I lined up two of the blocks together, right sides together, with the seams aligned. Then I pinned in place along one side, sewed a 1/4" seam along the pinned edge only, and pressed the seam. Next I laid the assembled blocks flat and aligned the remaining block on top of the bottom block, right sides together, with the seams aligned. I pinned in place along one side, sewed a 1/4" seam along the pinned edge only, and pressed the seam. 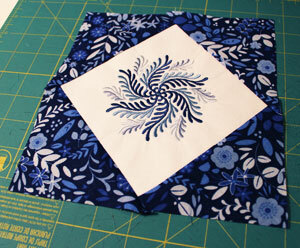 For the side borders, I cut two pieces of quilter's cotton to 2 1/2" wide by 21" high. Then I laid the right panel flat and lined up one of the borders on top, right sides together, along the left side of the panel. I pinned in place, sewed a 1/4" seam along the pinned edge only, and pressed the seam. To prepare the block for the left square, I drew a 9 1/2" by 9 1/2" square on the quilter's cotton, and measured and marked the center of each side by measuring and dividing by two. Then I drew lines connecting the marks. 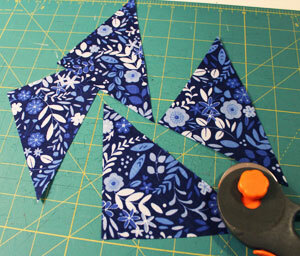 Don't cut out the shape yet as you'll need the extra fabric for hooping. 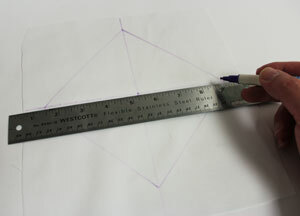 Create a paper template of the design and line it up with the center point of the fabric. 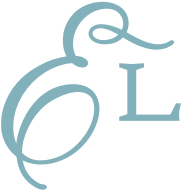 Make sure the design fits well within the shape, with at least 1/2" between the outer edges of the design and the edges of the shape. 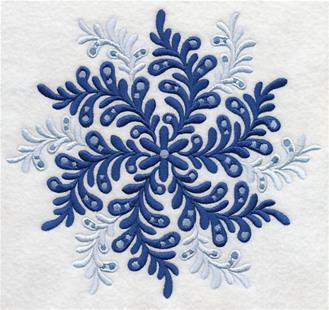 Hoop the fabric and stabilizer together and embroidery the design as you did earlier. When the design is finished, cut out the shape. 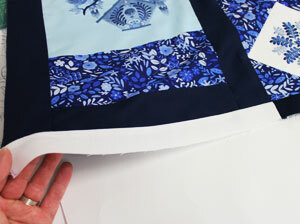 To prepare the inner borders, I cut two pieces of print fabric to 9 1/2" wide by 4 3/4" high and lined them up on top of the embroidered square, right sides together with the long sides of the border aligned with the top and bottom edges of the square. 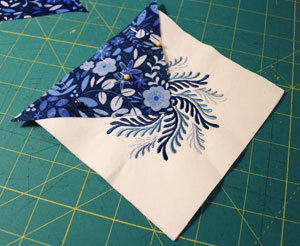 I pinned in place, sewed a 1/4" seam along each pinned edge, then pressed the seam. Next, for the top and bottom borders, I cut two pieces of quilter's cotton to 9 1/2" wide by 2 1/2" high and aligned them with the top and bottom edges of the inner borders, right sides together, with the long edges aligned. 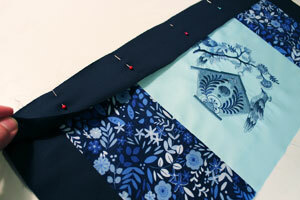 I pinned in place, sewed a 1/4" seam along each pinned edge, and pressed the seam. Line up the remaining side border along the left side of the left panel, right sides together, pin in place, and sew a 1/4" seam along the pinned edge. Press the seam. Now it's time to sew the panels together. Line them up, right sides together, with the right edge of the left panel aligned with the left edge of the right panel. Pin in place, sew a 1/4" seam along the pinned edge only, and press the seam. For the two-tone top and bottom borders, I cut two pieces of quilter's cotton to 13" wide by 1 1/2" high for the left sides of the borders, and two pieces to 7 1/2" wide by 1 1/2" high for the right sides of the borders. I aligned the pieces together, right sides together, with two short ends aligned, pinned in place, sewed a 1/4" seam along the pinned edge only, and pressed the seam. Then I aligned the borders along the top and bottom of the assembled panels, right sides together, with the seams lined up. 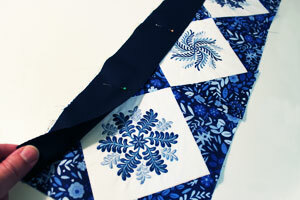 I pinned in place, sewed a 1/4" seam along the pinned edges, and pressed the seams. 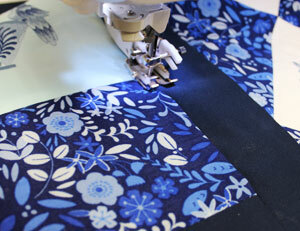 Next, to prepare the outer side borders, I cut two pieces of fabric to 1 1/2" wide by 23" high. I aligned the borders along the side edges of the assembled panels, right sides together, pinned in place, sewed a 1/4" seam along the pinned edges, and pressed the seams. Finally, for the fabric for the back of the table topper, lay the assembled front panel on top of the fabric, pin, and cut out the shape. Also, cut a piece of the cotton batting just as you did for the back. 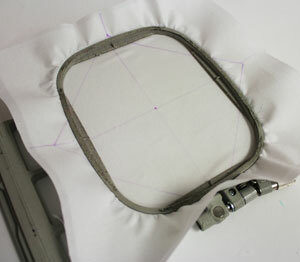 Lay the batting flat and line up the front panel on top with the right side facing up (wrong side faces batting). Align the back panel on top of the front panel, right sides together (wrong side of back panel facing up), and pin all the layers in place. 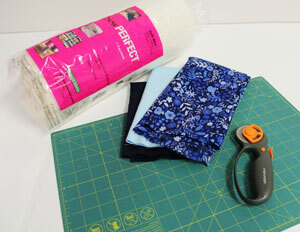 Sew a 1/4" seam along the top and side edges, leaving the bottom edge open for turning. I turned the topper right side out between the front and back panels (the batting ends up inside the topper), and pressed the seams. 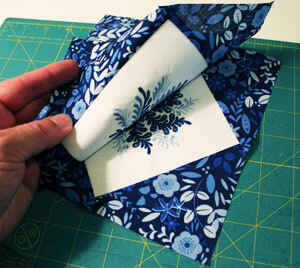 I also turned the fabric of the opening in 1/4" and pressed. Then I hand-sewed the opening closed with needle and thread. 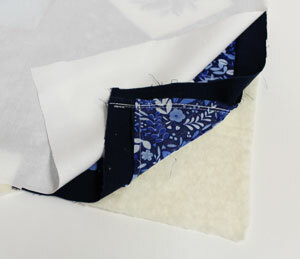 With nylon monofilament in the needle and matching thread in the bobbin (thread that matches the back fabric), quilt through all the layers by stitched along the existing seams of the front panel. I stitched around the inner edges of the outer border, and around the inner and outer edges of each block and inner border. 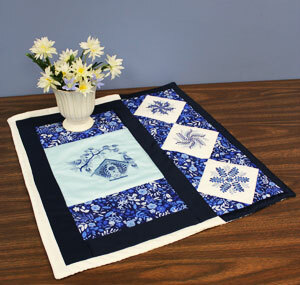 And now your quilted table topper is complete! 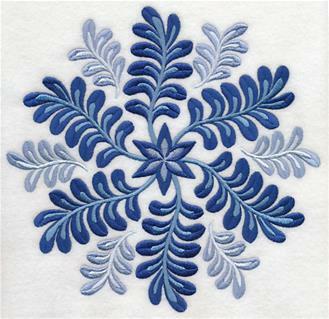 Your creativity can run free with the possibilities for fabric and embroidery combinations, and you'll enjoy a topper sure to beautify any table. 7.59" x 6.90" | 6.45" x 5.87" | 5.34" x 4.85" | 3.85" x 3.50"
7.80" x 7.27" | 7.40" x 6.90" | 6.28" x 5.85" | 5.20" x 4.85" | 3.85" x 3.59"
7.81" x 7.53" | 7.17" x 6.91" | 6.10" x 5.88" | 5.04" x 4.86" | 3.86" x 3.72"
7.78" x 7.80" | 6.91" x 7.80" | 5.86" x 6.94" | 4.86" x 5.76"